Get a personal insight into the life of Elvis Presley, the King of rock 'n' roll, through the largest Elvis exhibition ever mounted in Europe. 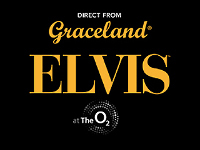 Elvis at The O2, is opening 12th December at The O2 and tickets are on sale now. The nine month exhibition will showcase over 300 artefacts direct from the Presley family's treasured Graceland Archives, many of which have never been exhibited outside of Graceland in Memphis, including cars, tour costumes and personal artefacts. The Elvis at The O2 exhibition chronicles the rise of the rock 'n' roll icon and how Elvis impacted popular culture around the world through his music, movies and personal style. Most importantly visitors will get an intimate peek behind the gates of Graceland. Gracelands Director of Archives, Angie Marchese, said "This is not a collection from auctions, they are personal items from Graceland, where Elvis lived most of his life. The exhibition tells the sorty of a music revolution that began when Elvis first stepped into a recording studio in 1954 and the lasting impact of his incredible legacy. Elvis Presley is the greatest of all music icons and these artefacts are the symbols of the man and the music that changed popular culture forever. As John Lennon said 'Before Elvis, there was nothing'." The Elvis at The O2 runs from 12th December 2014 until 31st August 2015. It's open seven days a week 10:00-20:30, Christmas Eve and New Year's Eve 10:00-18:00 (closed Christmas Day and New Year's Day). You can buy tickets at axs.com/elvis or visit elvisattheo2.com for further information.